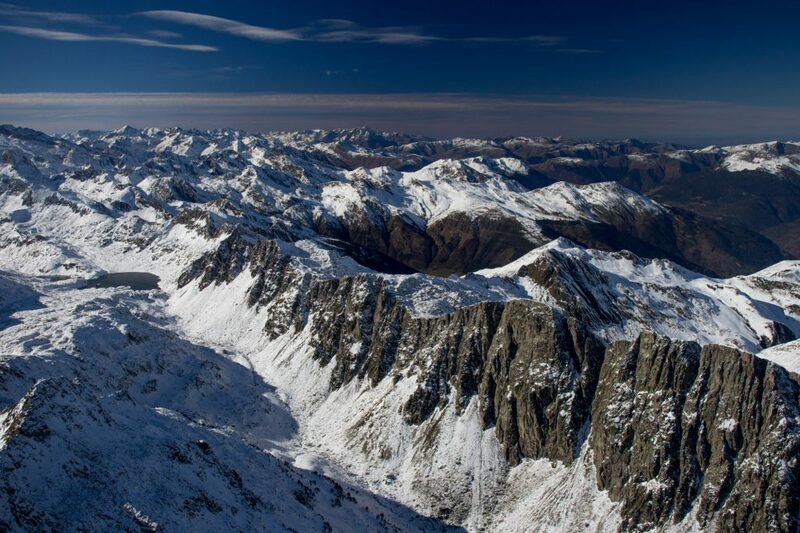 If someone asked me what a version of heaven in an airplane would be, I’d probably choose flying in the Alps in October. 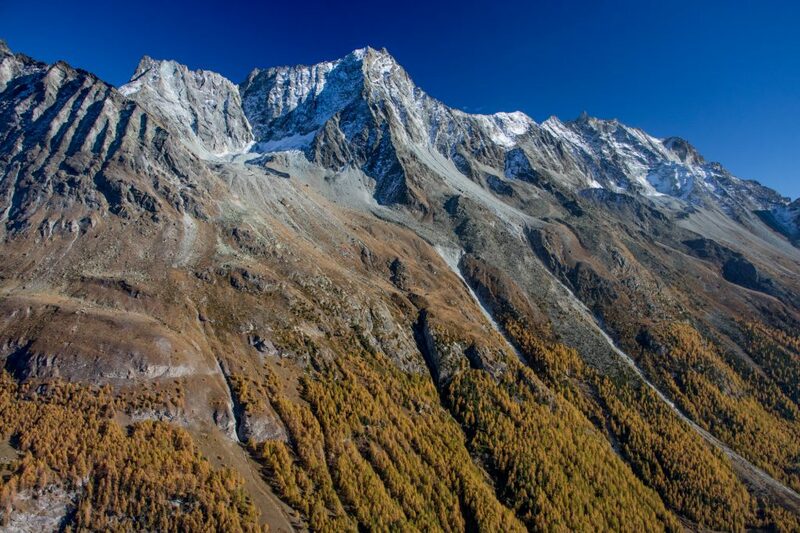 October has a majesty to it that I can’t get enough of, and the Alps, well, they’re the Alps. I had met a new friend who spends part of his time in Gstaad. 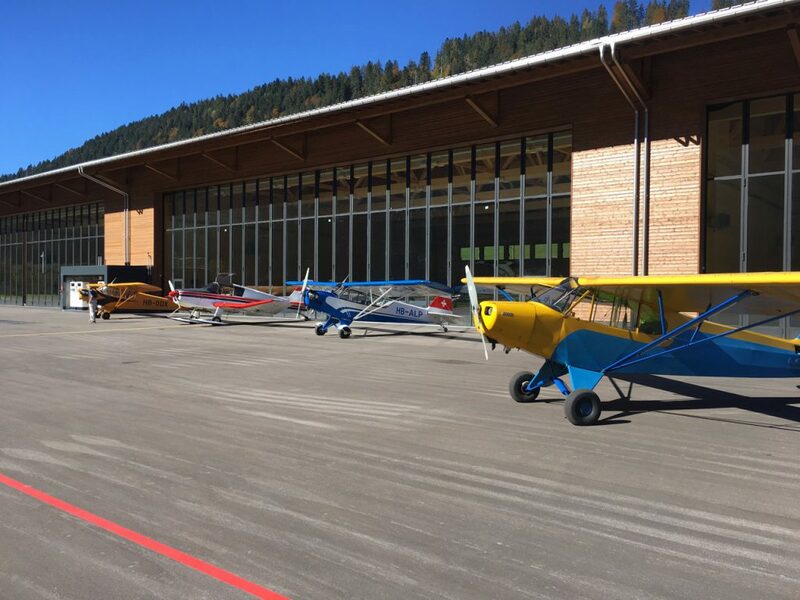 An American pilot, he loved the Cub, so we arranged that I’d fly over from Sion to Gstaad. 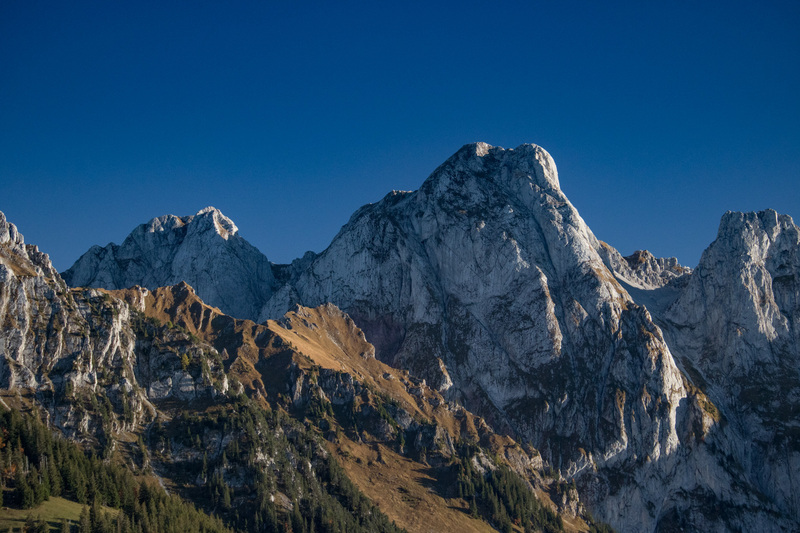 From there, we’d head to Interlaken, on to the headwaters of the Rhône River, and then wander along the Bernese Alps before descending into the Bernese Oberland back to Gstaad, where I’d make the quick hop over the ridge (9000’ or so) back to Sion. On the flight over, I went around the bend, crossing a section of the Oberland that I had not visited before. Upon entering left downwind over a massive piece of rock (Swiss patterns are intriguing), I noted a proliferation of old airplanes on the tarmac. After powering down, I noted a number of L-4s and other old aircraft, a result of some sort of group that happened upon the place. It was quite nice to see a pile of Cubs on a picture-perfect day in the Alps, so I snapped a shot before refueling for the next leg. 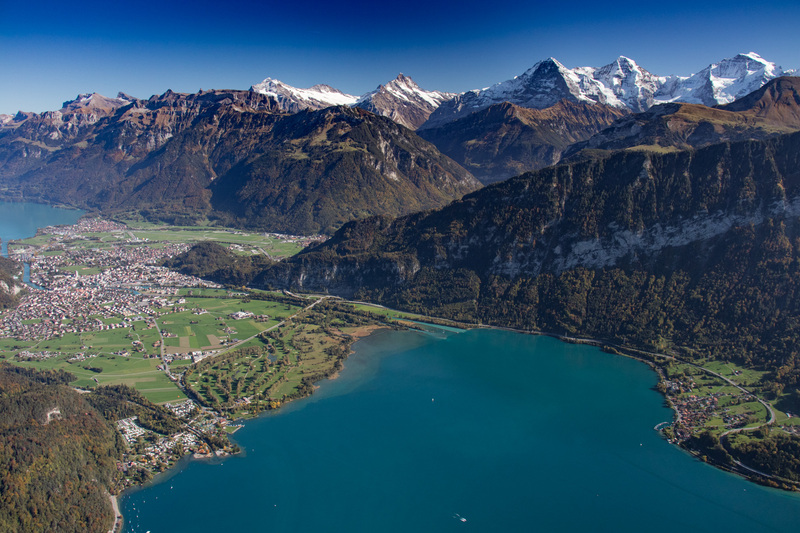 The flight over Interlaken is something I hadn’t yet done, even though it had been a dream for a long time. 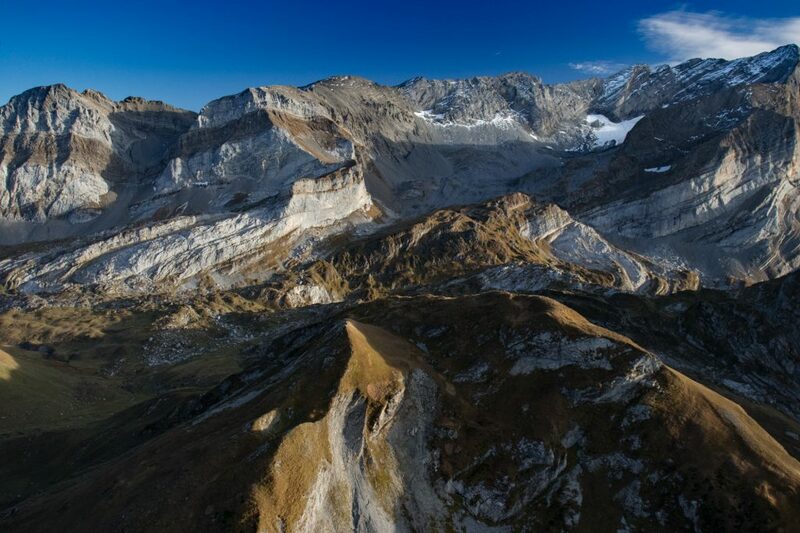 I used to use Google Earth’s “flight simulator” mode, specifically in this neck of the woods in the Alps, flying the F-16 over all sorts of precipitous terrain, stunned at what I saw on my computer screen. 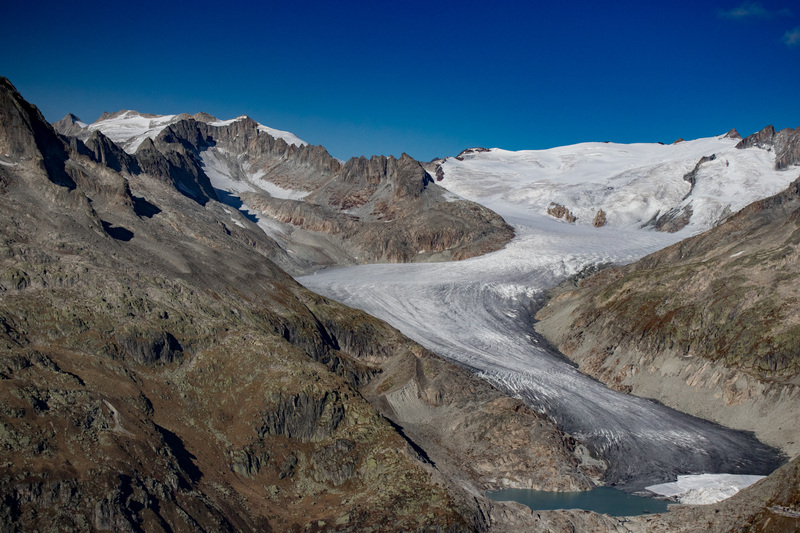 How could it be that glaciers spill thousands of feet down, or that proceeding over a mountain ridge, the ground could drop more than a mile? Today would be the day to experience it in real life, 10 years beyond my initial fantasies. 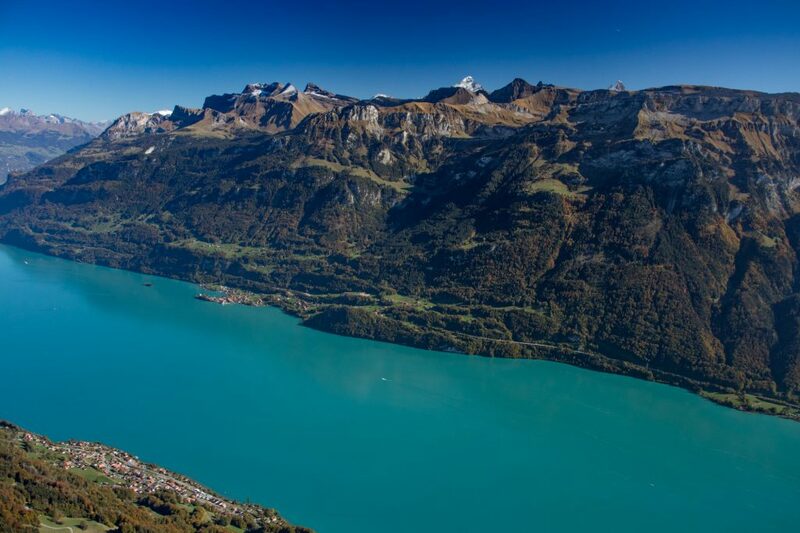 Interlaken was as stunning as expected. We were a bit high owing to the fact a 100 hp airplane doesn’t climb so well when loaded, and I didn’t want to drop down only to lug ourselves back up. 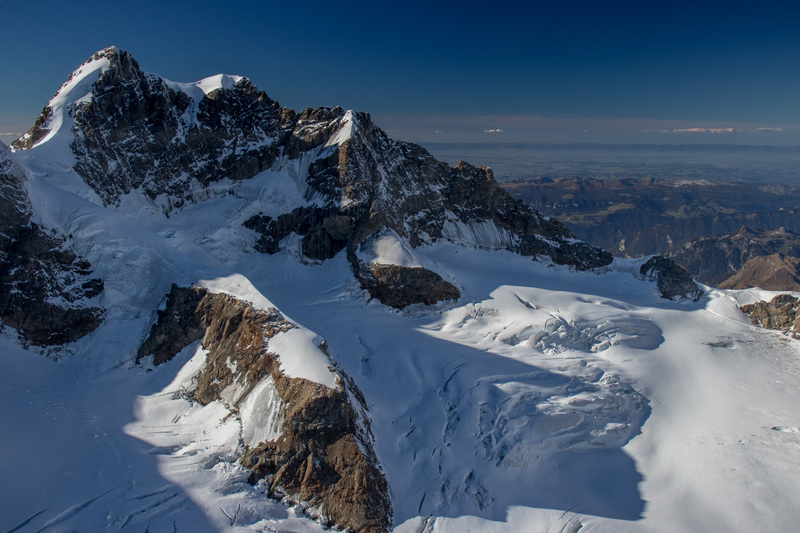 Besides, we were heading to a famous Swiss pass, for which I later hoped to get above 12,000’ if we could, to enjoy some of the higher terrain. It’s a debatable presumption in this airplane unless it’s the dead of winter. Battling a wind funnel that was not in our favor, we finally got over Grimselpass, turned west, and then let the terrain and wind lift us up. 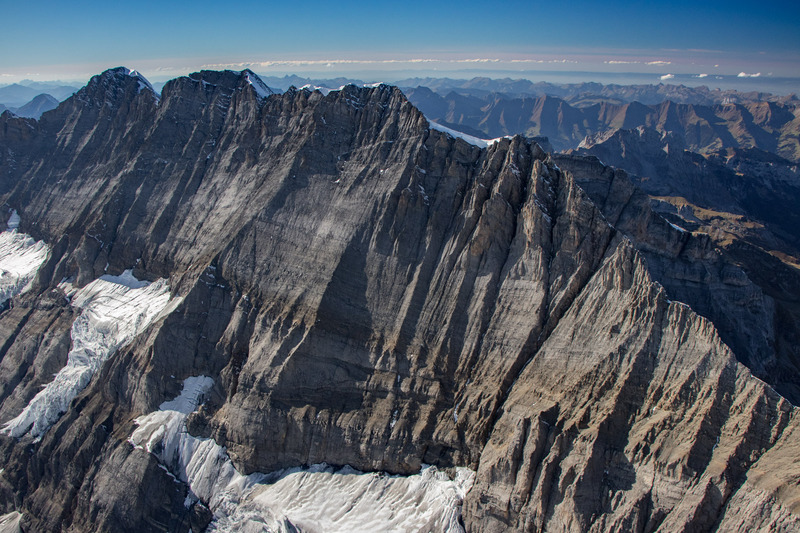 Unexpectedly, I got as high as I wanted to go, circling some enormous peaks, overflying those glaciers and mile-deep mountainsides that I had hoped to see. 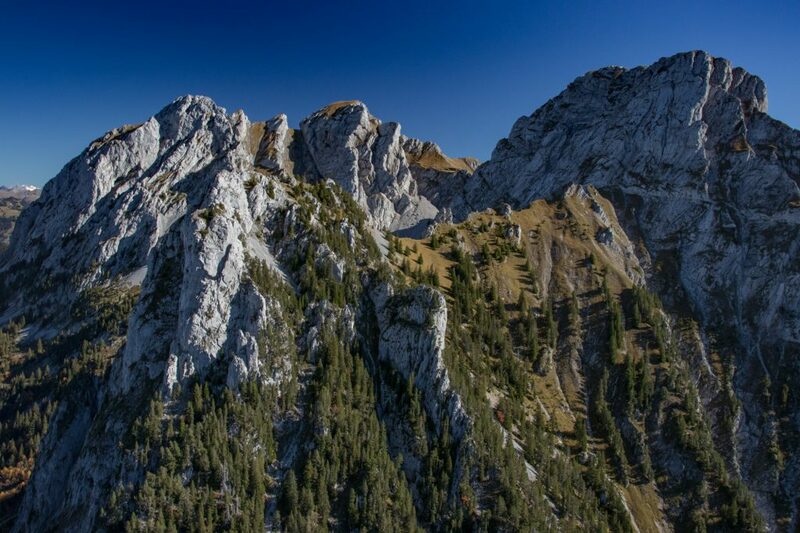 From there, it was a fun ride along where the Oberland and Alps meet, before the descent back into Gstaad for fuel. 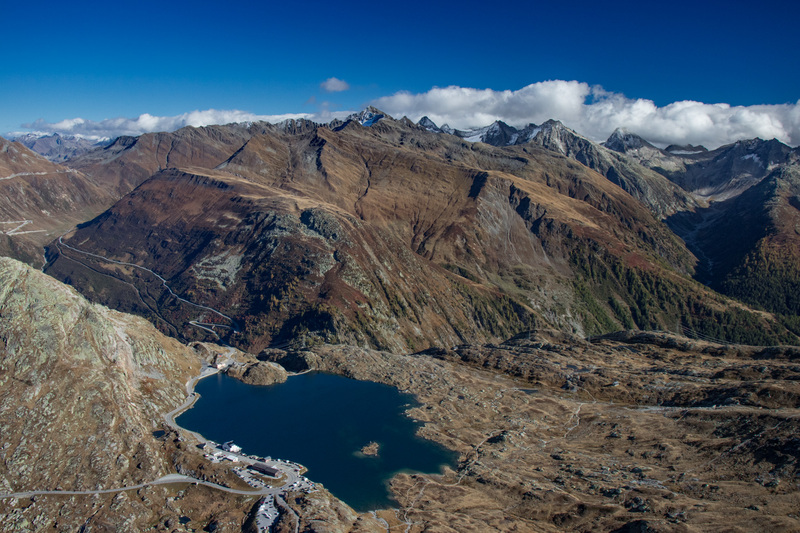 As the sun was getting low and the Swiss take time quite seriously, I got out of Dodge, went over Pas de Cheville in brilliant evening light, descended over vineyards in autumn color, and landed at Sion. 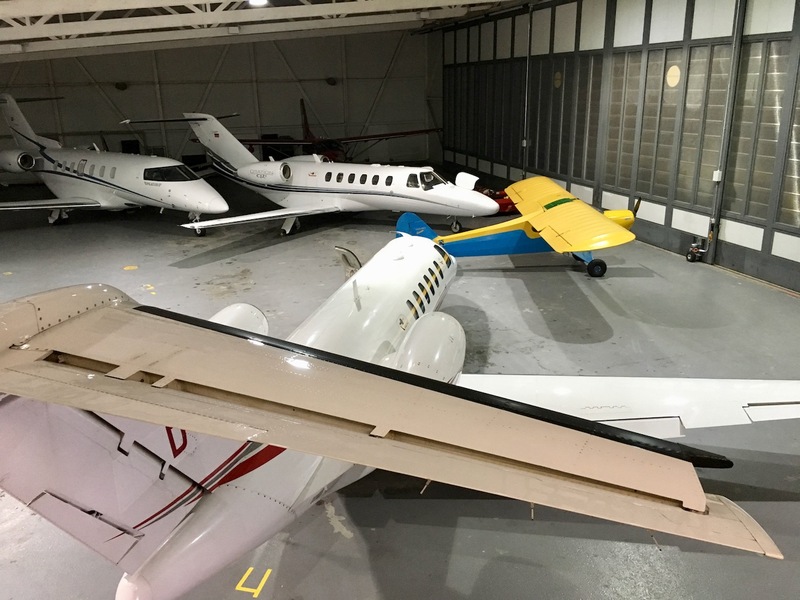 The last in the hangar, the Cub was parked in front of four business jets, leaving me with a feeling that such a flying day is as heavenly as it gets. 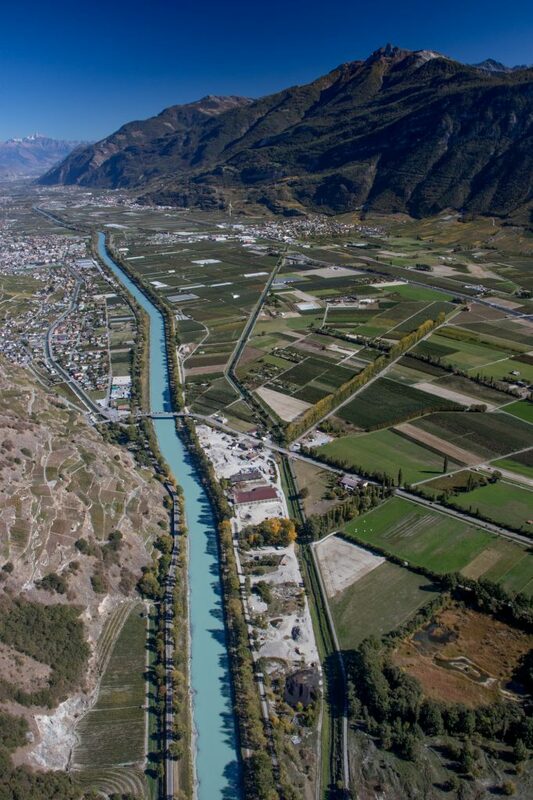 Looking back toward Sion before rounding the bend, Rhône River near Martigny. Not too far before left downwind for Gstaad. Two other Cubs on the ground at Gstaad. Even better. 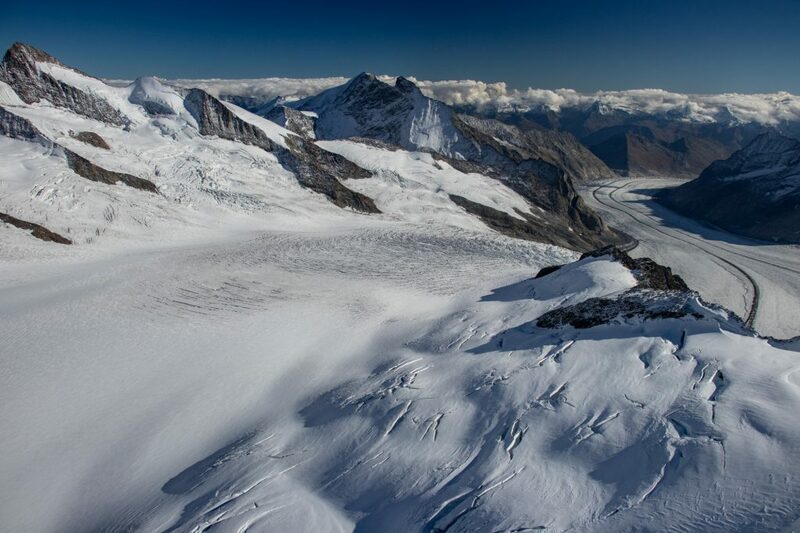 Rhône Glacier, source of the Rhône River. In summer 2017, the Cub went to where the Rhône meets the Mediterranean. Along the Bernese Alps looking into the Oberland. 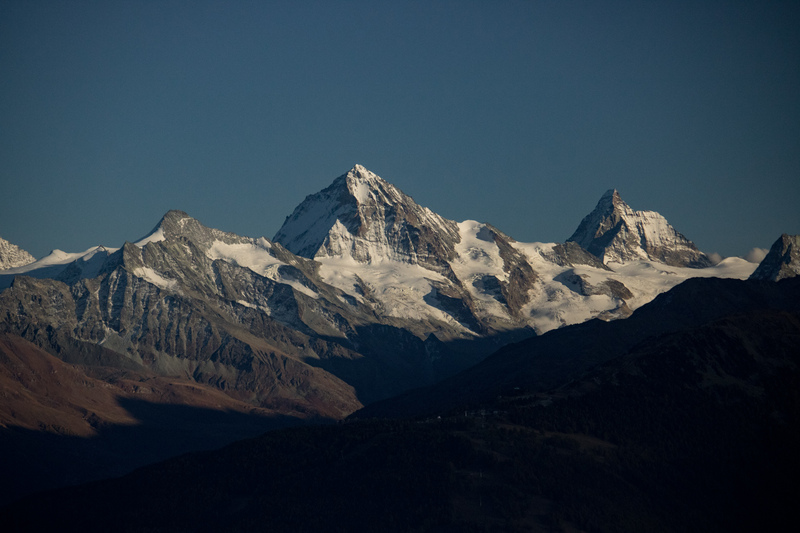 Bernese Alps in evening light before heading over the pass. 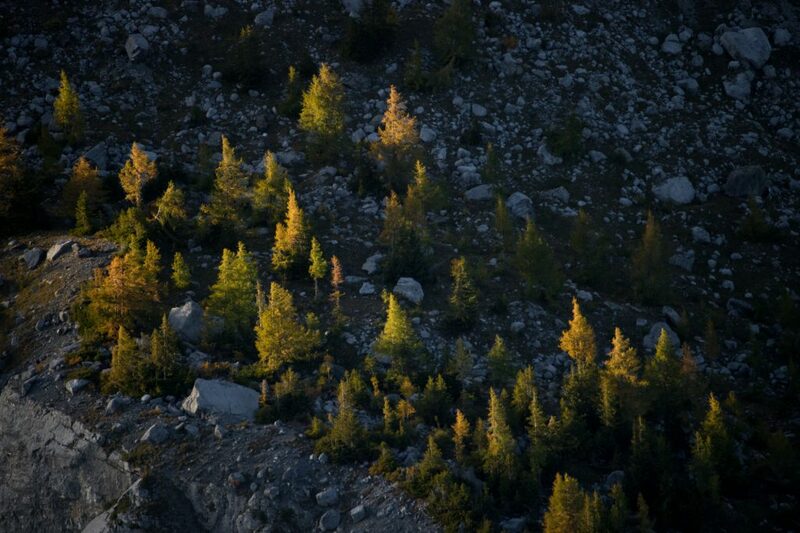 Larch trees near timberline in evening light. Pennine Alps in the distance from the Sion control zone. PA-11 in Sion, parked as it should be! A perfect flying day…. 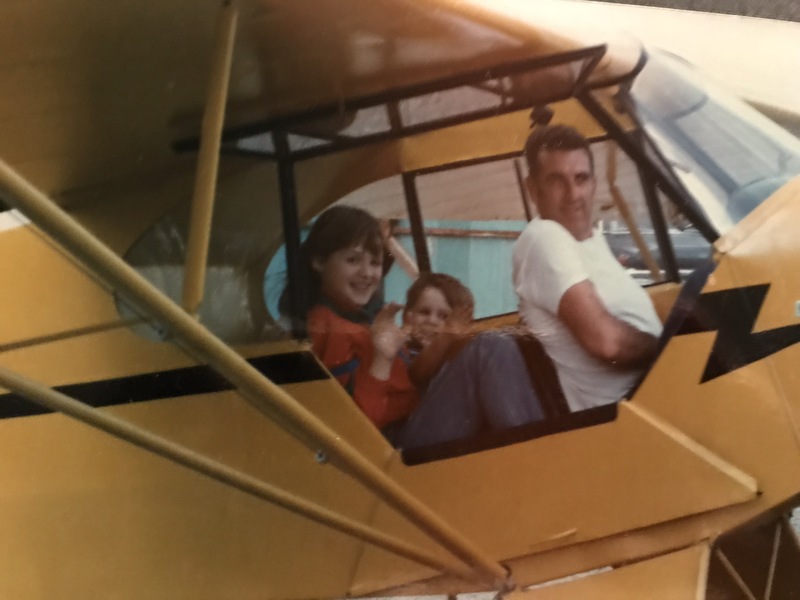 Before I go any further, this is the grandfather that took me for my first ride in a J-3 at age 2, that began teaching me to fly the Super Cub at age 8, and restored the PA-11 for my flight training at age 16. 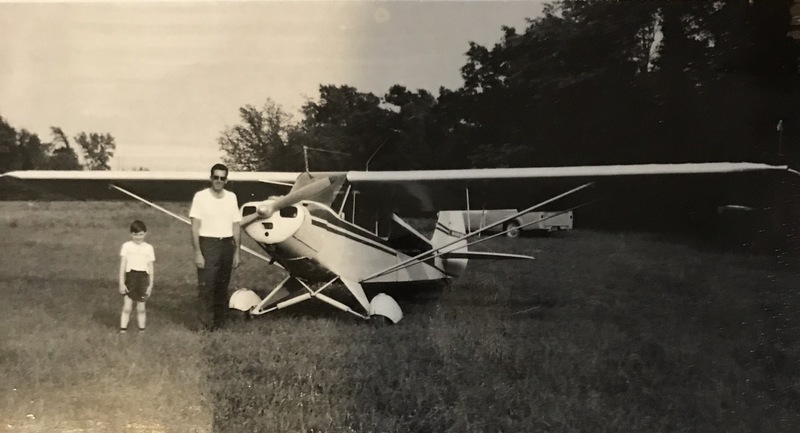 The airplane I use for this blog is the same plane that I used for my solo flight, and it was done on his grass strip, which was next to my parents’ property. Aside from that, he had a Cub and Super Cub restoration shop on his property, for which I spent most of my youth admiring aircraft in various stages of restoration, watching the process or just hanging out in the shop because that’s where I’d rather be. He had made it clear for a long time that he was not going to deal with the disabilities and inconveniences of old age. Sure, we all say something like that, though this guy always meant business when he spoke. Within a few hours of arriving back from my flight, he was on the way to hospice, where he died a few hours later at age 87. In the following days, my sister offered to send over some scanned photos. I thought the idea was silly. Hadn’t I seen them all? Well, “why not” I thought and agreed to it, for which I got a pile of photos and saw the whole story in a different light. 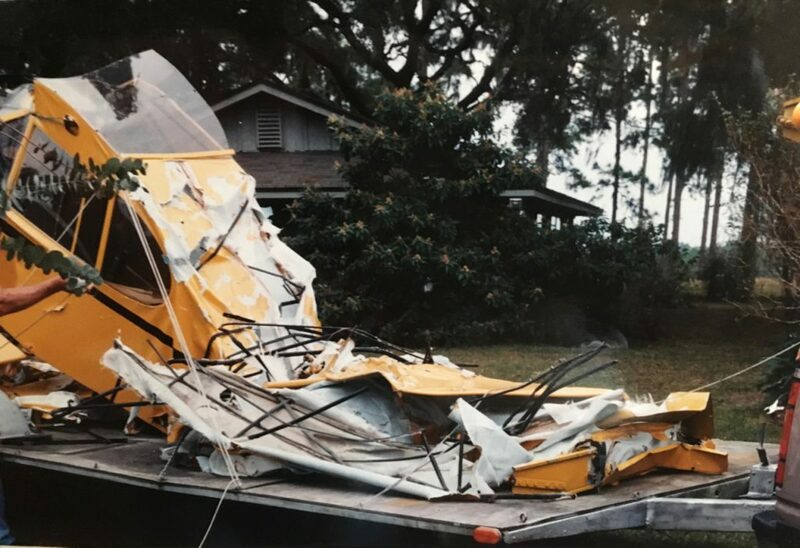 Whether it was my late father at age 5 in the 1950s standing next to a Super Cub, or me sitting in the backseat in the 1980s with my sister as a J-3 was being started, or a long series of crashed airplanes that he brought home for repair and restoration, I noticed some things I hadn’t seen before. For one thing, the Cubs and Super Cubs look alike. The Ford pickups in the background are like a lineage of Americana, changing with the times as the airplane in front of it doesn’t change at all. Then there was the matter of my sister, for which the photos seemed to indicate she was quite happy back in the 80s, sitting in the airplane, more so than I remember. We recently talked, and I discovered that she was going to become a pilot twice, and various major life stages got in the way, even though he had taught her how to land the Cub. How can one grow up together and miss such obvious things? At least it puts a smile on my face that I am not the only descendant to take to aviation in the family. 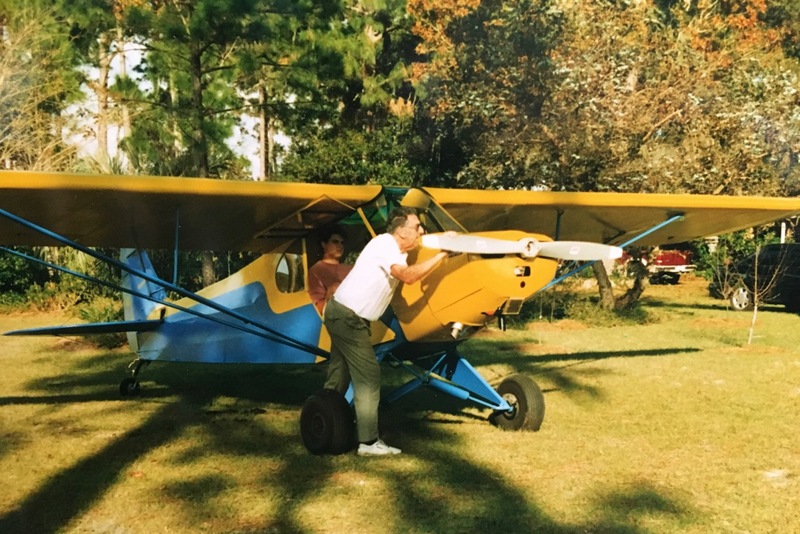 My late father with my grandfather and his Super Cub. 1950s. Note the old pickup. Advance to the mid 1980s. 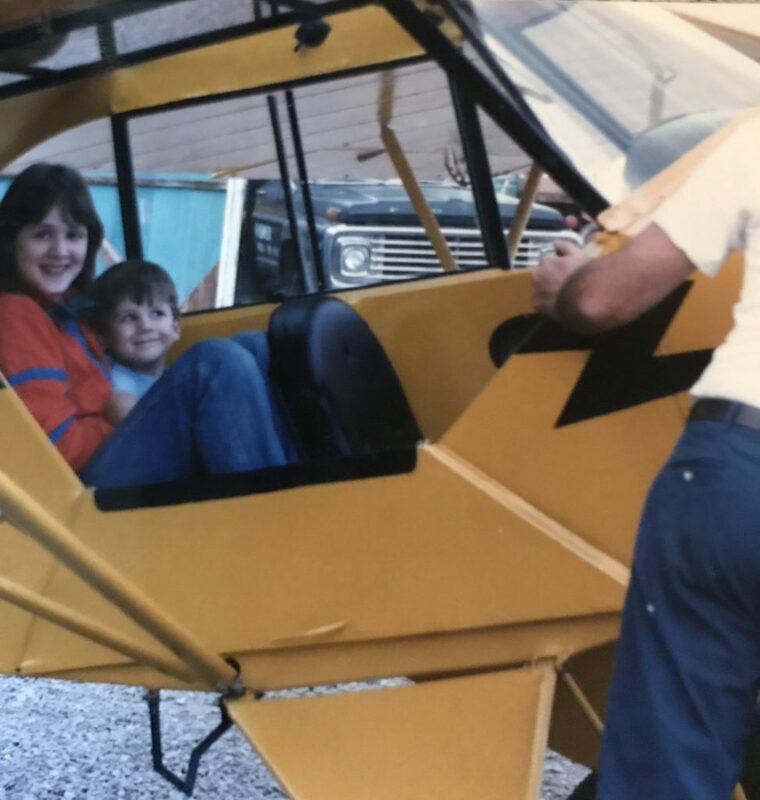 That’s me sitting with a big smile on my face (it looks the same when I fly today), while my grandfather hand cranks the J-3. The Ford in the background is newer…. Now its 1997. I have gotten a lot bigger, and watch puzzled as my grandfather hand cranks the PA11 I now have. He had a relatively new Super Cub with a starter and I wondered why this airplane lacked one (teenagers…). There is yet another newer Ford in the background yet the Cubs are still Cubs. This was a big part of my youth: my grandfather sourcing crashed airplanes for repair. I wouldn’t have traded it for anything. I decided to exercise some caution and hold off on flying for a bit. My wife aptly asked if my first flight could “not be around Mt. 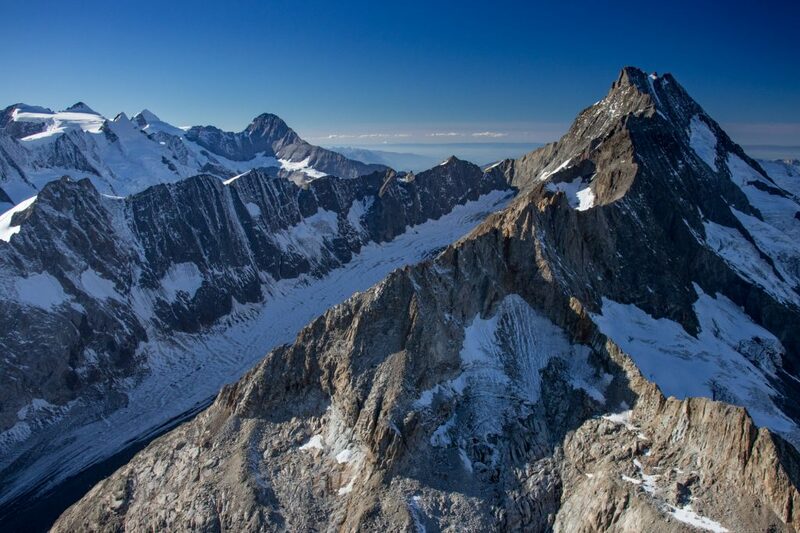 Blanc” (15,774’), for which I agreed. 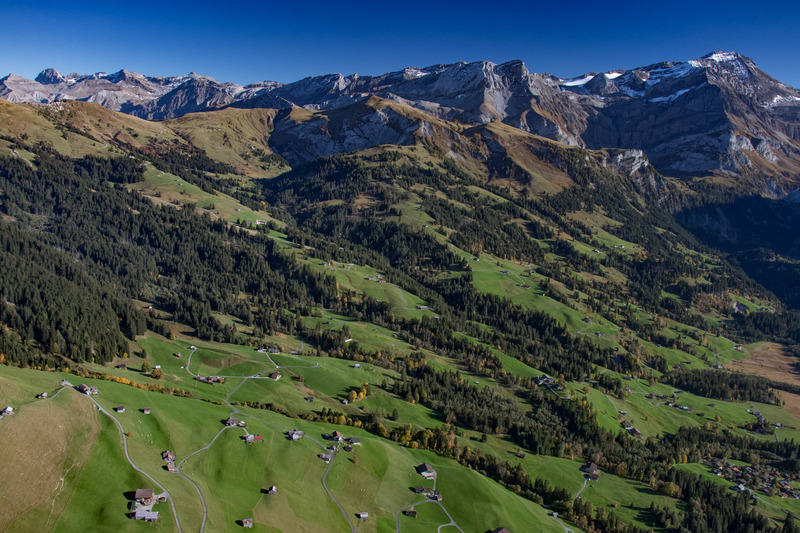 As we had to return to Spain due to running out our immigration allowance in Switzerland, I chose to take a flight on a blue-sky day to scope out my feelings, and, well, like my grandfather, flying is a great way to lift the mood. When my father had terminal brain cancer and I visited a decade ago, my grandfather thought that it was a great time to ride in the Bell 47. While conventional wisdom said I shouldn’t have, I too couldn’t resist and hopped in. My grandmother often said that when I was young, I was a little version of him. It’s hard to describe him in words, as on one hand, he is unassuming, and yet on another, he did whatever he wanted and didn’t let anything stop him. I am quite aware that my inspiration for my present approach to life can be credited to his influence and giving me the gift of aviation. Everything about this paragraph is an understatement. I had expected him to live into his mid-90s based on his robust health, and therefore hadn’t thought too much how I might feel about aviation once he was gone. There was some concern that my motivational equilibrium might change, and I found myself having to face the question sooner than expected. The flight to Spain from Switzerland was both functional and uneventful, though I have been flying quite a bit since. Each time I get in the plane, I feel alive and it feels like a bit of him is alive, and I think the best answer to how I feel is…..more flying. My wife at one point said that she felt awful for “ruining such a good flying day,” and I wouldn’t have it any other way, other than to have been in New York instead of 4000 miles away. Whether it was the picture perfect skies, flying the Cub he restored, the litany of old airplanes at Gstaad, fulfilling a dream in the Alps, or the Cub sitting in front of a bunch of business jets, everything about the day was a culmination of so many factors that started when my grandfather saw a Piper Cub advertisement in 1939, drew them in grade school, walked to a gas station to work in his early teens to save up for lessons, and bought his first J-3 in the 1940s. 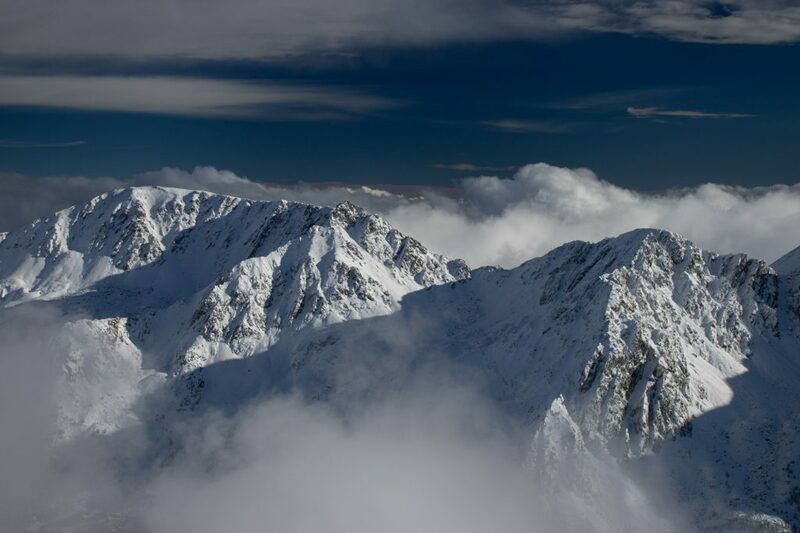 From those early days to the decades that passed into my flying career, it made that day in the Alps possible, and will hopefully lead to more dreams being fulfilled for others in the future, for that is the gift of aviation. Test flight on a nice day to make sure my equilibrium is kosher. Larch trees in full color. While conflicted, its refreshing to fly. 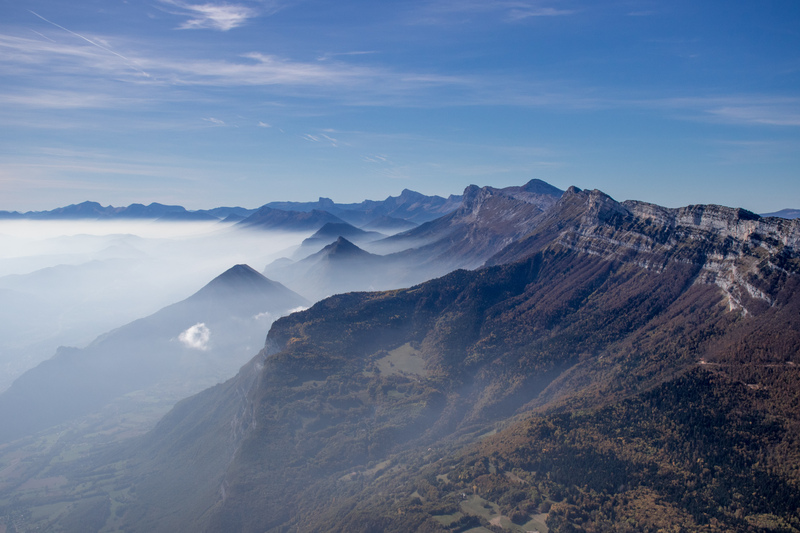 Over Grenoble, France on the way to Spain. Wandering around the central Pyrenees. 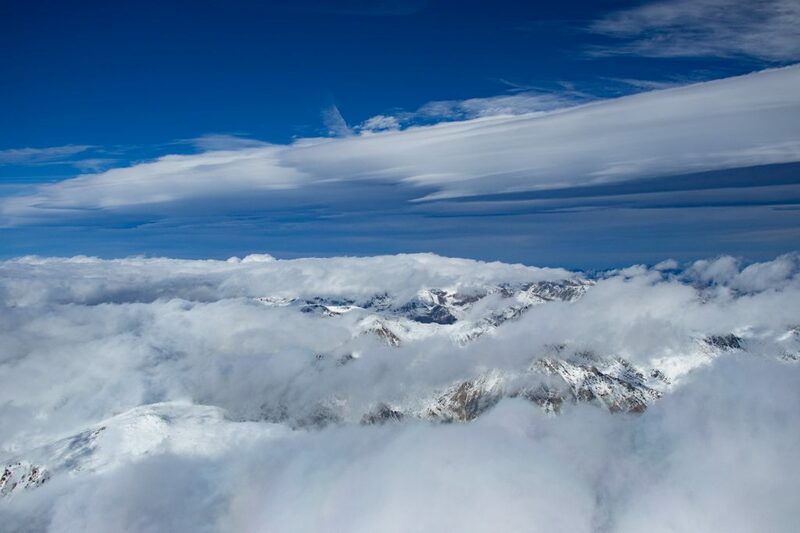 And some mountain waves over the convergence of Andorra, France, and Spain. I guess I can say I’m back in the saddle.